Where are Cleopatra and Mark Antony buried? Did the Donner family resort to cannibalism? Where is Billy the Kid buried? 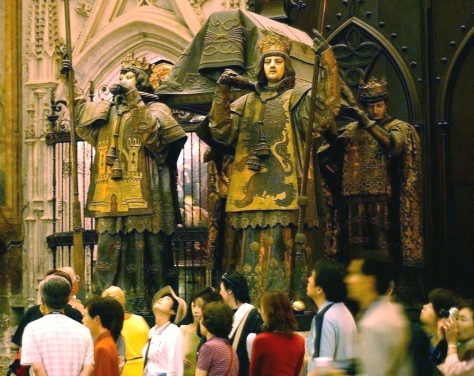 Christopher Columbus' remains in Spain? 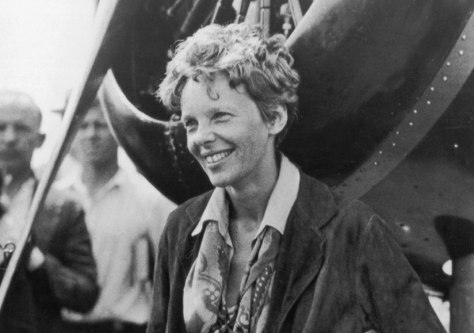 Amelia Earhart raised the spirits of Depression-era America as she soared into the aviation record books with feats of altitude, distance and endurance. The mood took a gloomy turn, however, when she and her navigator Fred Noonan disappeared over the Pacific Ocean on July 2, 1937, during a much-heralded attempt to fly around the world. Their fate remains one of aviation's greatest unsolved mysteries. Theories abound: They ran out of fuel and crashed into the Pacific Ocean. They were captured by the Japanese and executed. They survived, and Earhart lived out her life as a housewife in New Jersey. A prominent theory with tantalizing clues holds that they survived the crash landing and but perished as castaways on Nikumaroro, an uninhabited island in the republic of Kiribati. An expedition to the island in 2010 recovered pieces of a pocket knife and a glass jar that may have belonged to the castaways. If DNA analyses on these and other items match Earhart's, the mystery may finally be resolved. Click ahead for six more stories of historical mysteries. Excavations underway at a temple near Alexandria, Egypt, may reveal the final resting place of the doomed lovers Cleopatra and Mark Antony. The Egyptian queen and Roman general committed suicide in 30 B.C. following their defeat in the battle of Actium for control of the Roman Empire. But where the lovers were buried is unknown. Zahi Hawass, Egypt's top archaeologist, believes the lovers were put to rest in the temple of Taposiris Magna and launched a dig with a Dominican-led team to locate the tomb. "It my opinion, if this tomb is found, it will be one of the most important discoveries of the 21st century because of the love between Cleopatra and Mark Antony, and because of the sad story of their death," he told reporters during a tour of the temple. 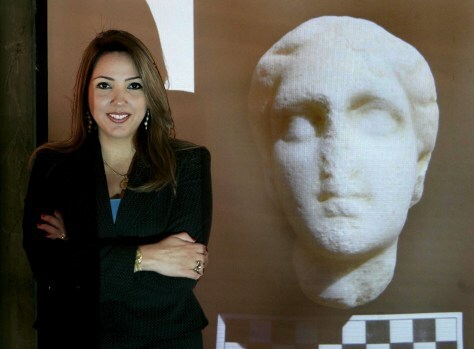 Dominican archaeologist Kathleen Martinez is shown here with an alabaster bust of Cleopatra that was found at the excavation site near Alexandria. Genghis Khan united warring tribes in 1206 and became the leader of the Mongols, creating an empire that eventually stretched from China to Hungary. The famed warrior's tomb, however, has remained a mystery ever since his death in 1227. According to legend, his burial party killed anyone who saw the procession. The slaves and soldiers who attended the funeral were also killed. Horses then trampled evidence of the burial, and a river was diverted to flow over the grave, which is thought to lie somewhere near Genghis Khan's birthplace in Khentii Aimag. Expeditions to locate the tomb have been aborted due to concerns that the excavations would disturb the site and destroy the soul that serves as its protector. 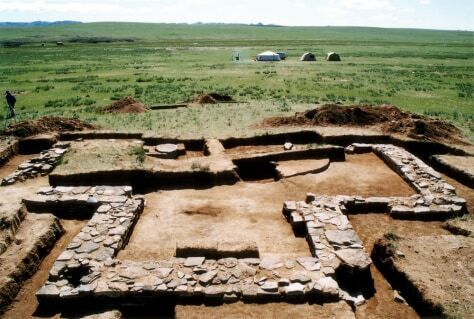 In 2004, archaeologists uncovered Genghis Khan's palace, shown here, and they suspect the tomb lies nearby. The legend is a harrowing tale of survival: A group of pioneers headed for California in 1846 got stuck on a mountain pass in the Sierra Nevada and resorted to cannibalism to survive the winter. But the claims that they feasted on human flesh may have been exaggerated, based on an analysis of bones found in a hearth along Alder Creek, where at least some of the Donner Party passed the time. The analysis shored up accounts that the family dog, Uno, was eaten, as well as a steady supply of cattle, deer and horse. No human bones were found at the site. While cannibalism may have occurred, if it did, the bones were treated in a different way. Perhaps the bones were buried. Or perhaps they were placed on the hearth last and have since eroded, according to project scientist Gwen Robbins, a professor of biological anthropology at Appalachian State University. 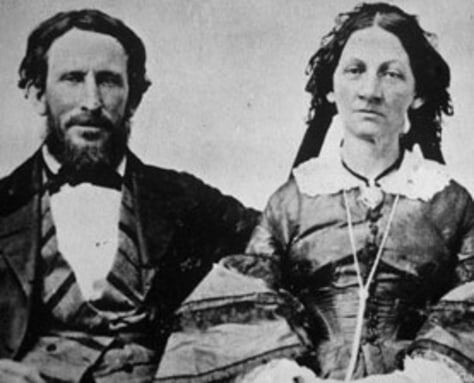 Donner Party survivors James Reed and his wife Margaret Reed are shown in this photo from the 1850s. 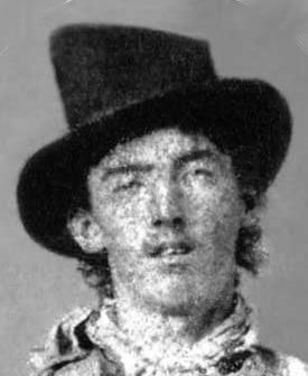 Legend holds that outlaw Billy the Kid was gunned down by Sheriff Pat Garrett in 1881 and buried in Fort Sumner, N.M. A headstone marks his grave, but a controversy has roiled since the 1930s when an Arizona man named John Miller claimed that he was the legendary outlaw. Garrett, he said, shot the wrong man and lied about it. Matters became even more confused a few decades later when a Texan named "Brushy" Bill Roberts came forth and said he was the real Billy the Kid. An investigation aims to resolve the case by exhuming the body of Billy the Kid's mother and comparing her mitochondrial DNA to genetic material from the three men. But the investigation is controversial on several fronts. For one, the graves have been moved over the decades and nobody is certain the bodies and headstones match up. In addition, if the real Billy the Kid turns out to be buried in Texas or Arizona, it would kill off a legend that helps draw tourists to the New Mexico gravesite. In 1492, Christopher Columbus sailed the ocean blue; after he died in 1509, his remains remained on the move. He was originally buried in the Spanish city of Valladolid, but his remains were shipped to the Caribbean island of Hispanola (modern-day Dominican Republic and Haiti) in 1537, in accordance with his will. When the Spanish lost the territory to France in 1795, they shipped Columbus's remains to Cuba, where they stayed until the Spanish-American War prompted their return to Seville in 1898. The tomb is shown here. The Dominican Republic, however, says Columbus' remains never left Hispanola. In 1877, a box was uncovered in a Santo Domingo cathedral with an inscription identifying the remains as belonging to the "illustrious and distinguished male Cristobal Colon (Spanish for Christopher Columbus)." DNA analysis of bone fragments from the Seville remains and those of Columbus' brother Diego, also buried in the city, are a perfect match. When researchers announced those findings in 2006, they declared that the century-old dispute was resolved. But DNA from the Dominican remains has yet to be studied, leaving the case not quite fully shut. Bolsheviks gunned down Russian Czar Nicholas II, Empress Alexandra and their five children in 1918, but for 90 years the whereabouts of two of the children, Prince Alexei (heir to the Russian throne) and a daughter (Maria or Anastasia), remained unknown until 2008. That's when their bones were recovered from a grave near the rest of the Romanov family near Yekaterinburg in the Ural Mountains, about 900 miles east of Moscow. The bones from the second grave were burned and drenched in sulfuric acid, presumably to conceal the victims' identities or conditions at death. But scientists were able to examine mitochondrial DNA, which is passed down from mother to children. They also matched up Y chromosome markers from Crown Prince Alexei and Czar Nicholas II. 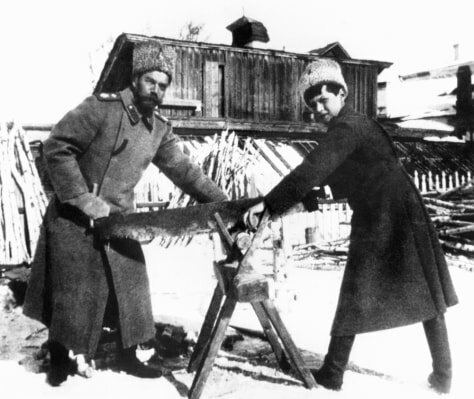 Czar Nicholas II, left, and the Crown Prince Alexei, are shown cutting wood in this photo, taken at a Siberian prison months before their murder in 1918.